Fractals are self-similar patterns or detailed patterns repeating themselves. Fractals are one of the most beautiful because of their precise and repetitive nature. 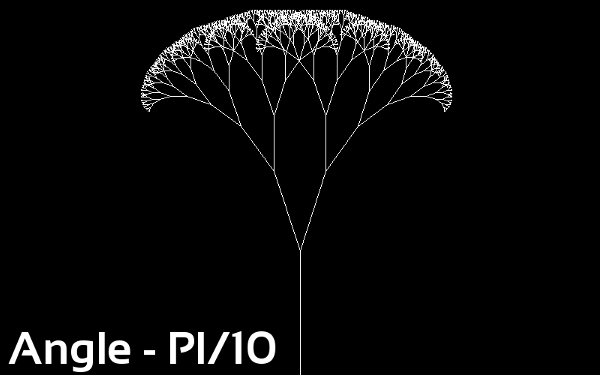 Examples of fractals are found abundantly in nature. Rivers, snow-flakes, frost to name few of them. 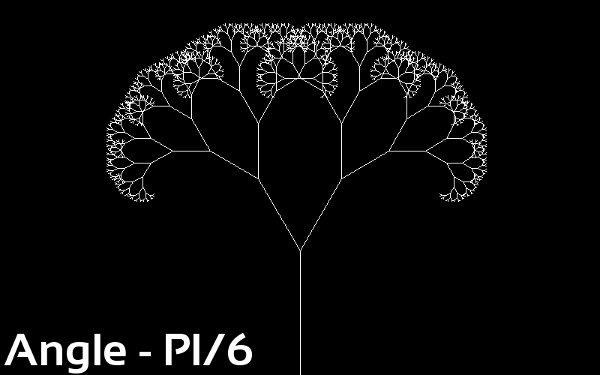 One of the very basic figure that fulfills requirement of repetition is called a recursion tree.We draw a line, it divides into branches, then the branches further divide into still smaller ones until infinity. By now you may have guessed the reason of naming it a 'tree'. On a computer however we do not go on till infinity and stop the drawing when we reach satisfactory results. 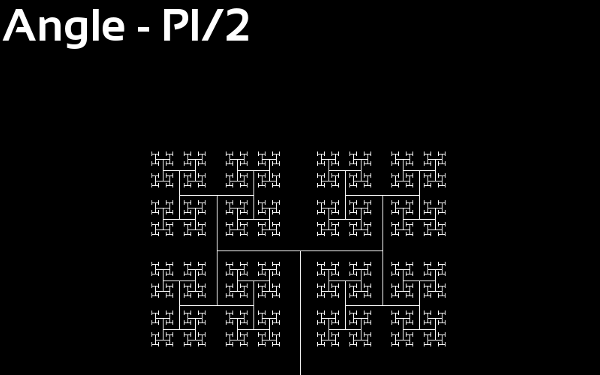 In this post I illustrate the method of creating a Recursion tree with two branches. It can however be modified to add more branches with a small knowledge of Mathematics (Vectors). As you may have guessed by now, we are going to use a recursive function (What is a recursive function? The one which calls itself.) to perform the task. ANGLE is the angle (in radians) at which the new branches emerge with respect to the previous one. SHRINK_FACTOR is the factor by which the size of next branch is reduced relative to the current one. MAX_RECURSIONS is the maximum number of the times the function will call itself. 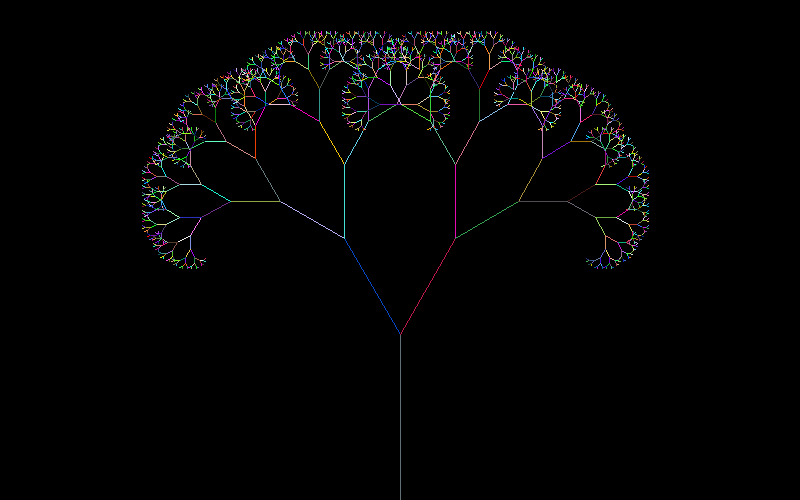 The recursive function which draws a branch of the tree. 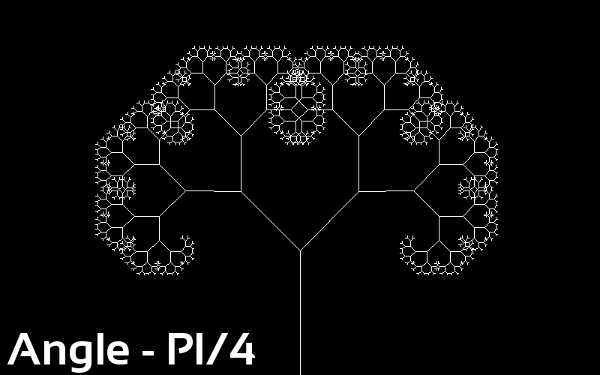 It takes in the initial co-ordinate (pointX, pointY), the direction vector (directionX, directionY), the size/length of branch and the recursion number. Now we have the initial point, length and the direction vector of the branch. We find the final point of the line by multiplying the direction vector with length and adding it to the initial point. Then set the color WHITE and render the line on the image. We find the length of next branch by dividing the length of current branch by the SHRINK_FACTOR. Find the direction vector of the next branch using basic trigonometry, increase the recursion number by 1 and call the function drawBranch again with the newly computed values. Then in lines 36 and 37 we find the direction vector of the branch with angle on the opposite side (-ANGLE) and call drawBranch again.